4 × = 32 Required Please enter the correct value. This week, the Bitcoin price leapt as much as 60% from its lows on Sunday as the dark cloud of the Bitcoin "civil war" finally began to dissipate. The price of Bitcoin rose as high as $2,948.51 on the CoinDesk Bitcoin Price Index Thursday after sinking as low as $1,836.92 on Sunday. 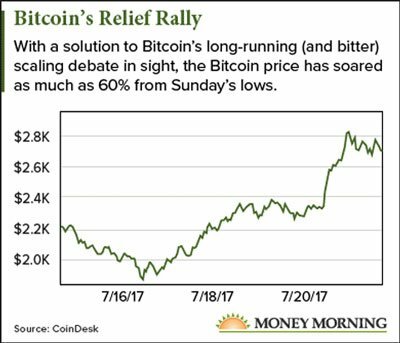 The primary force behind this rally was a clear sign of resolution to the two-year fight about how best to scale the Bitcoin network. Anxiety that the impasse would force Bitcoin to "fork" into two competing versions was what dragged the Bitcoin price down last week. The unexpectedly rapid adoption of a proposed solution known as SegWit2x is why the price of Bitcoin reversed so dramatically. Signs that SegWit2x was gaining consensus on the network caused the Bitcoin price to spike almost 26% in 14 hours on Thursday. The software was designed so that a network support level of 80% for SegWit2x over the course of a 336-block segment on the Bitcoin blockchain would "lock in" the SegWit part of this solution. "SegWit" is short for "segregated witness," an option that squeezes more transactions into each one-megabyte Bitcoin block. This solution would increase the network's capacity to process Bitcoin transactions by 60% to 100%. Right now, each block is close to full, threatening Bitcoin's ability to grow and fulfill its potential. As the Bitcoin community watched, SegWit2x approached the 80% threshold about halfway through the latest 336-block segment. The issue was in doubt until several major Bitcoin miners switched over to the SegWit2x camp. It ended up with 93.8% support. Bitcoin fans on Reddit celebrated with posts declaring "To the moon!" – a phrase long used by Bitcoiners to express optimism about the potential for the price of Bitcoin to soar. Still, the reason why the Bitcoin price hasn't gone even higher is that this latest development doesn't end the process. At least 50% of the Bitcoin miners need to continue signaling support for the SegWit code over the next 336-block segment (about two-and-a-half days). It's very unlikely that many miners will back off now. So in about two weeks (the time for the miners to chew through the next 2016 blocks), the "SegWit" code will activate. That will alleviate the transaction congestion and reverse rising transaction fees. And it avoids – for now – a hard fork that would split the community. The "2x" part of SegWit2x has to do with increasing the block size from one megabyte to two megabytes. Combined with the SegWit technology, this change will increase the capacity of each Bitcoin block by 120% to 200%. Pairing the two ideas into a single SegWit2x proposal was a compromise intended to end the Bitcoin civil war. More than 50 Bitcoin miners, startups, and developers signed on to this agreement in May. But the apparent success of the first phase does not guarantee the success of the second. After 12,960 more blocks (likely to be early November), the miners will conduct a second "vote" on whether to approve the increase to two-megabyte blocks. Opinion in the Bitcoin community is divided over whether the miners will remain true to the agreement they signed in May. I believe the miners will approve the two-megabyte blocks. They don't have much incentive not to. And they've already agreed to it in principle. While the extra room in each block will cause the fees the miners collect to drop, over time the rising number of transactions will make up for it. Keeping the one-megabyte size limit is short-sighted and ultimately self-destructive, as it would cripple Bitcoin's ability to grow. Approval of the 2x part of SegWit2x would be a huge milestone for Bitcoin. 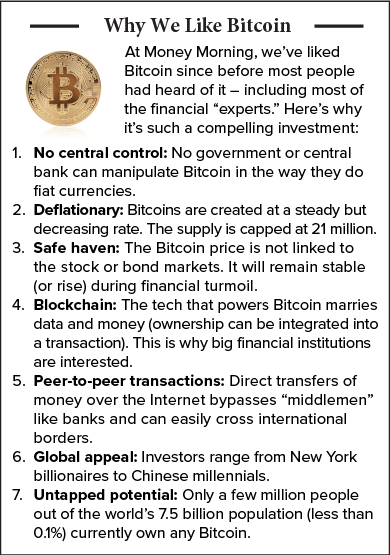 It would definitively end the Bitcoin civil war and the uncertainty surrounding it. How do I by Bitcoin? What is the symbol? I tried through my. Brokerage and they said they do not trade in Bitcoin?? Go to coinbase exchange, or ?get their mobile app from the App Store on your phone. I think you still need the authy app too, it's part of their security for your wallet which I would "call your stock or bank account- but in this case it's (coinbasewallet) is your way to buy & sell Bitcoin. They even added a feature like you stock exchange has where you can set $ & # limits to automatically buy & sell it. You could possibly even play on their money by selling at 100% gain half your purchase, so then only your profits would be at risk of loss? It takes a few days? to set accounts up. Oh, if you are new saw they're offering $10 free Bitcoin to you & the person who referred you:) if you put at least $100. in account. Good luck from another Kathleen ???? Thanks for reading Money Morning. I've put together this How to Buy Bitcoin Guide to help answer your question.